From Carla Stehr’s viewpoint, the ocean is very small. It’s also a wondrous, liquid world teeming with all sizes of life that lends itself to all kinds of artistic interpretation. As a marine biologist, Stehr photographed an assortment of aquatic organisms with a scanning electron microscope. The images show complex patterns, the tiniest of hair follicles, the varying designs of single-celled plants called diatoms, which can only been seen with a microscope. At 7 p.m. Wednesday, April 10, Stehr is giving a presentation called “Communicating Science Through Art” at the Front Room Gallery of Bayview Cash Store. Large format photos of her microscopic images hang on the gallery wall as part of an art show featuring several artists work of the Salish Sea. Stehr is part of the Sound Water Stewards Speaker Series: Science, Art and History of the Salish Sea, which is also sponsoring the current gallery show through April 26. Stehr began working as a scientist for National Marine Fisheries Service in 1976. After finishing a master’s degree in fisheries in 1982, she enrolled in evening art classes and experimented with drawing, scientific illustration, colored pencil and watercolor. In 1996, she found herself suddenly addicted to fabric after making her first quilt for a newborn niece. The textural quality of stitch and fabric led to more experiments, she said, and eventually to astounding scenes of sea life incorporated into quilts and fiber art. Wee wonders of the sea she’s viewed up close many times include tiny moon glow anemone and amphipods, which are tiny shrimp like creatures that swim in the water, burrow in mud, jump on beaches and are disparagingly called sand fleas. Stehr combines textural properties of fabric and stitching to lend an organic quality to her my art. Stehr compiled informative microscopic images that she and other scientists had photographed during 30 years of scientific research into a book, “Sea Unseen: Scanning electron microscopy images from Puget Sound and beyond,” published by the U.S. Government Printing office in 2012. That led to a “Sea Unseen” exhibit at the Seattle Aquarium. The surface of a spider, skin of a shark and sea snails without shells called nudibranchs have all stirred Stehr’s imagination and ended up as inspiration for her quilts. She also views fish a little differently. A scanning electron microscope image of single-celled aquatic plants called diatoms. This fabric is made of several layers of cloth, stitch and paint, and is based on the surface of diatoms. Diatoms are microscopic, single-celled aquatic plants which provide much of the world’s oxygen. This fabric is made of several layers of cloth, stitch and paint, and is based on the scanning electron microscope images of diatoms. 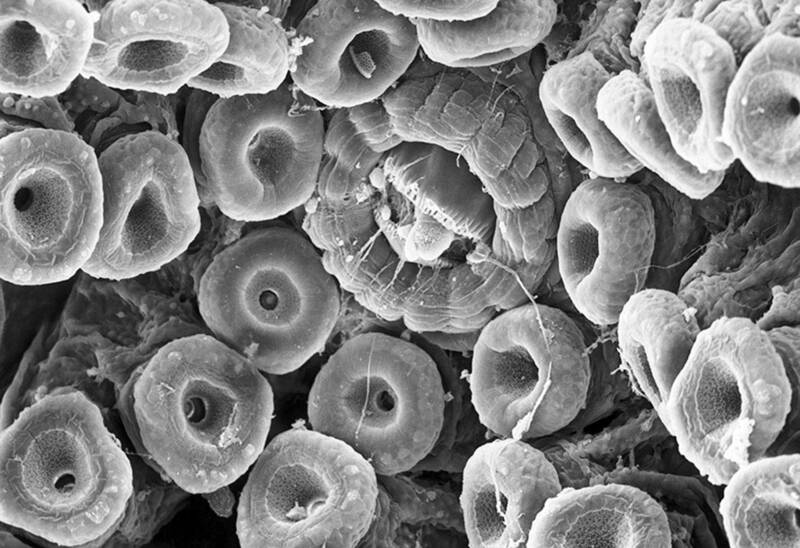 A scanning electron microscope image of Spiny Dogfish shark skin. Shark skin is covered with tiny teeth-like denticles. Scanning electron microscope images of Asteromphalus diatoms found in the coastal waters of Washington State. Image of Odontella diatoms found in Washington’s coastal waters. Scientist and artist Carla Stehr.